The Pyxis P16IO is a USB to digital interface, providing 16 lines of real world digital I/O to a PC for system integration and control. 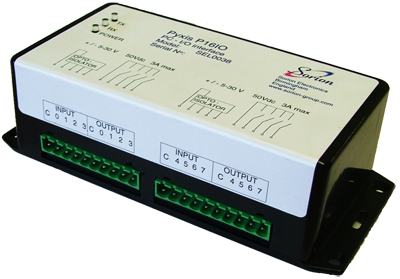 The Pyxis P16IO is provided with 8 opto-isolated digital inputs and 8 relay digital outputs. These are arranged in two banks of 4 inputs and four outputs. The common for each back of 4 I/O is suitable for active high, low or AC operation. The power for operation is derived from the PC host over the USB interface, simplifying installation, status LEDs give power and USB activity indication. The Pyxis P16IO is ideal for integration into automotive & component test systems. The P16IO will fail safe in the event of a USB link failure. The Pyxis P16IO is fully plug and play with Microsoft Windows XP and Windows 7. Suitable windows drivers and example application code (VB6) are supplied. We also offer a free small tray-app that allows the Pyxis P16IO to operate as a keyboard emulator. The eight digital inputs can be configured to emulate any keyboard character or a text string, including control characters.